Short stay in El Salvador. After two extreme crazy nights in Antigua – Jungle Party Hostel, I guess the name says it all – it was time for me to leave Guatemala. 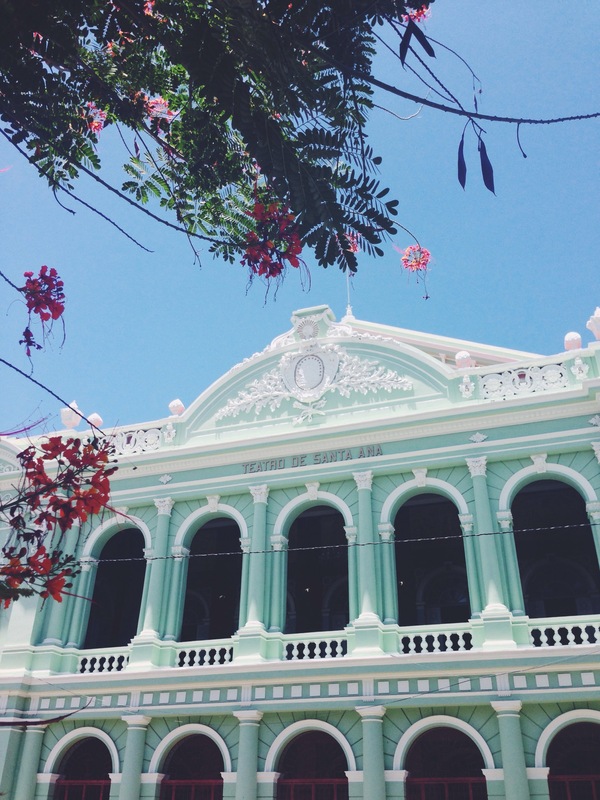 Antigua is a great city and I wouldn’t have minded staying there, but I had the urge to travel forward. Since I had to pass El Salvador to reach Nicaragua anyway, I decided to explore the country a little bit more. I decided to go to Santa Ana, where I found one of the best hostels I’ve ever stayed at – for the price of ten dollar a night you have a normal bed, personal fan and plug, bathroom for girls and one for boys, swimming pool, roof terrace, laundry room, hammocks, pool table, tv room with more than 200 new movies, 2 kitchens with every kitchen utensil you could ever think of and a hostel owner that drives you to the busstation and makes you popcorn when you’re watching a movie – too bad there were only four people staying at it, including me. To be honest, you can see Santa Ana in two hours, without a need to hurry. There’s a weird fake gothic cathedral, a theatre and a nice view from the hostel’s roofterrace. Of course, the city is more a base to discover its surroundings. 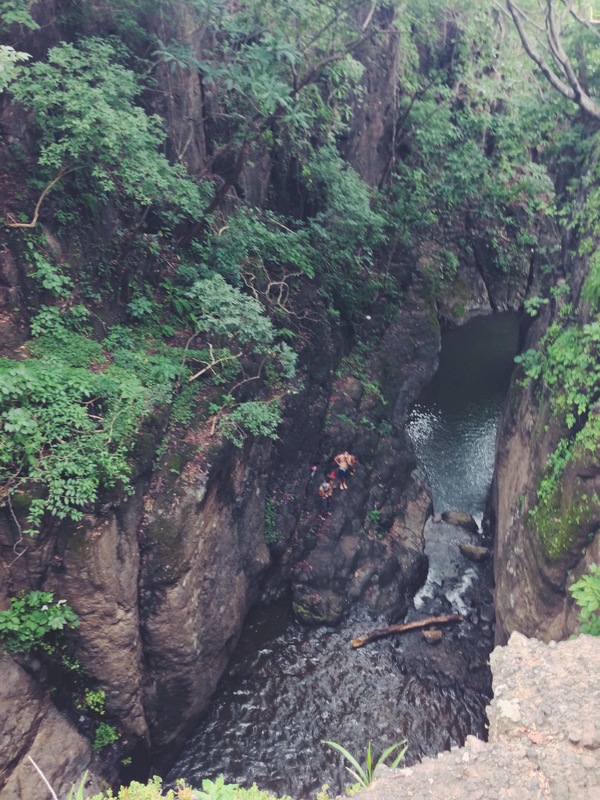 Like every country in Central America also El Salvador has its fair share of vulcanoes, lakes and waterfalls. And beaches. And chickenbusses. 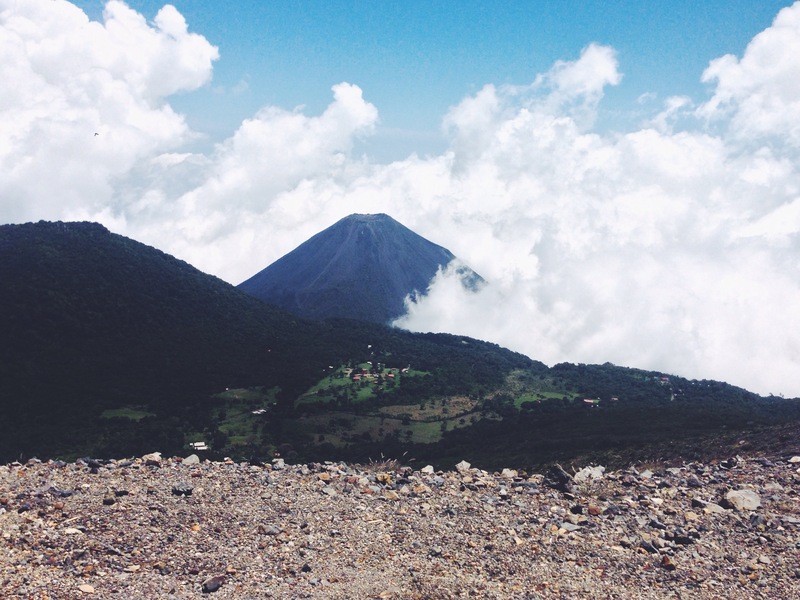 On my second day in Santa Ana – the first day I spend walking in the city, searching an ATM that would accept my visa and floating in the swimming pool – I decided to hike up the Ilamatepec volcano, together with two other guests of the hostel. I hadn’t hiked for a while, so I was bursting with energy and in a good mood to hike for a couple of hours. At the end, I was thinking of quiting before reaching the top, luckily, our assigned police officer – oh yeah, did I tell you that every group needs a police officer accompanying you the whole trip? – told me we were one of the faster groups, hiking it in one and a half hour in stead of two. And he could know, he did it already 652 times. So after ten minutes I reached the top anyway. The view was stunning. 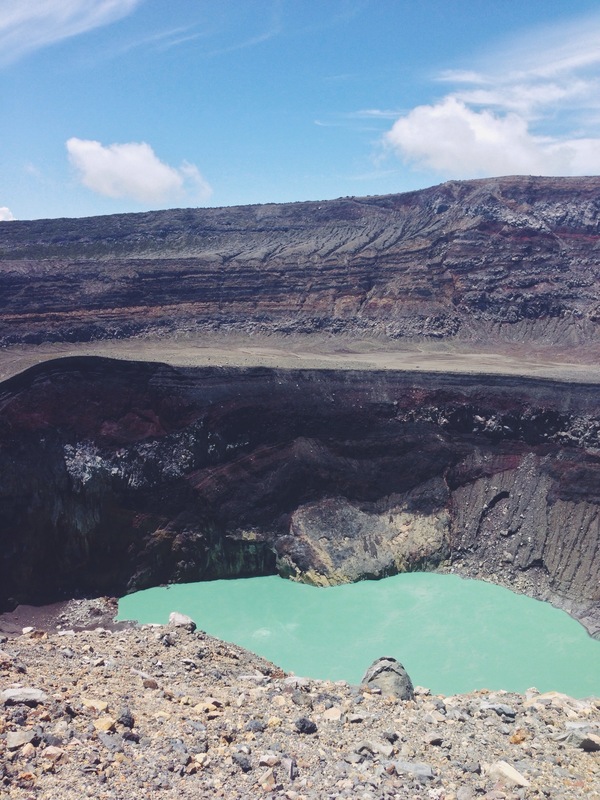 One black new volcano cone, lake Coatepequ on the other side and one turqoise sulfurlake in the crater. Worth the hike. Because of the lack of people in Santa Ana – where’s my socializing in the evenings? 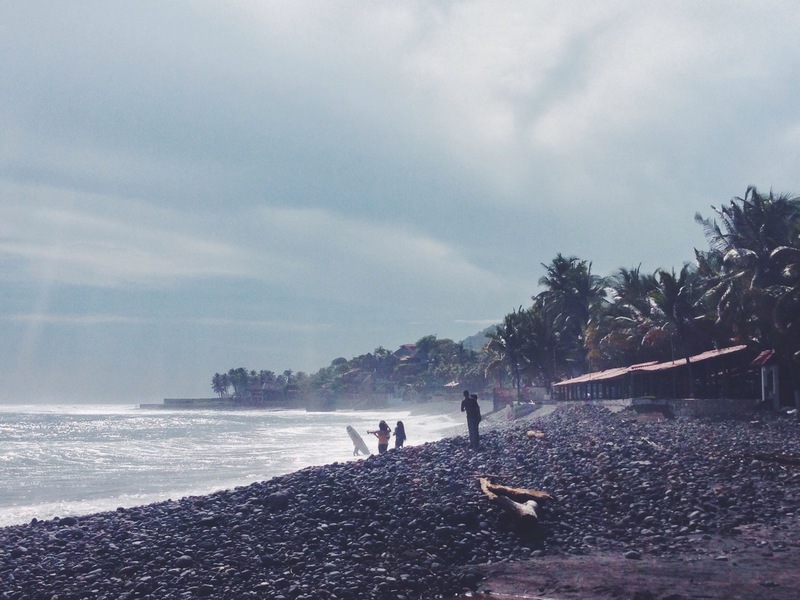 – I decided to go to El Tunco, also known as the ‘surfer’s paradise of El Salvador’. Although I don’t surf. And it isn’t a good place to learn….because the waves are too good, the sea is wild and the coastline has tons of rocks scattered all over, so pretty brutal when you make a mistake. Anyway, I headed to El Tunco. El Tunco was quiet. More people than in Santa Ana, but still pretty tranquillo for the place to be in El Salvador. Spend the afternoon walking on the beach, watching surfers – always a nice view – and swimming in the pool, socializing with a few other hostelguests. The other day we – hurray, people – decided to check out one of the waterfalls close by, taking the chickenbus with a group of eleven people – some Australians, some Americans, some Canadians and a Belgian girl – It took us a while before we found the right busstop – it’s always a guess – but we found it after all. 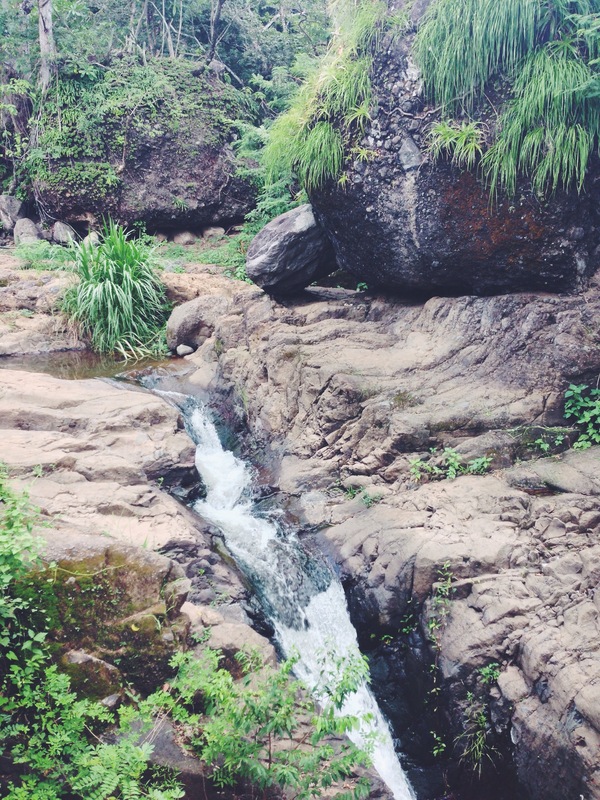 While sitting/standing on the bus, one of the locals offered to be our guide, so after forty minutes we found ourselves walking in the rain, through the bushes, climbing rocks on our way to a ‘what seemed to be a cool waterfall’. Most of us on flip flops. Once arrived, the waterfalls were great. I hoped for a more Roberto Barrios/Semuc Champey like waterfall so I wouldn’t be forced to jump into it, but no, only jumping this time. Since I’m not really fond of jumping off things – I already had my share of jumping on this trip – I decided to watch and help filming with the go pros everyone was carrying. Though I had some really nice experiences, it was time to leave. 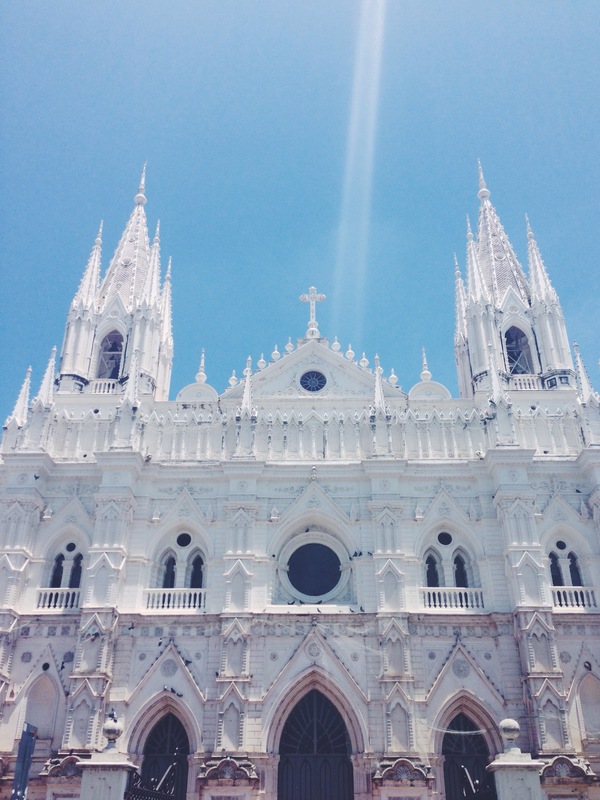 The lack of people made me look forward to my time in Nicaragua, and I took a shuttle to Leon the other day. 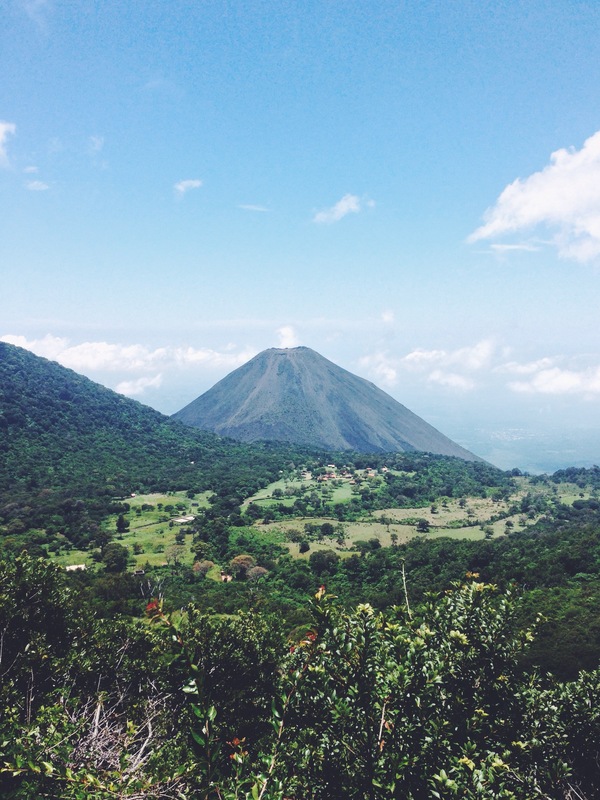 So why so few people in El Salvador? First of all, low season has started. Rainy season and all students gone after the summer holidays. Second, ‘for safety reasons’. 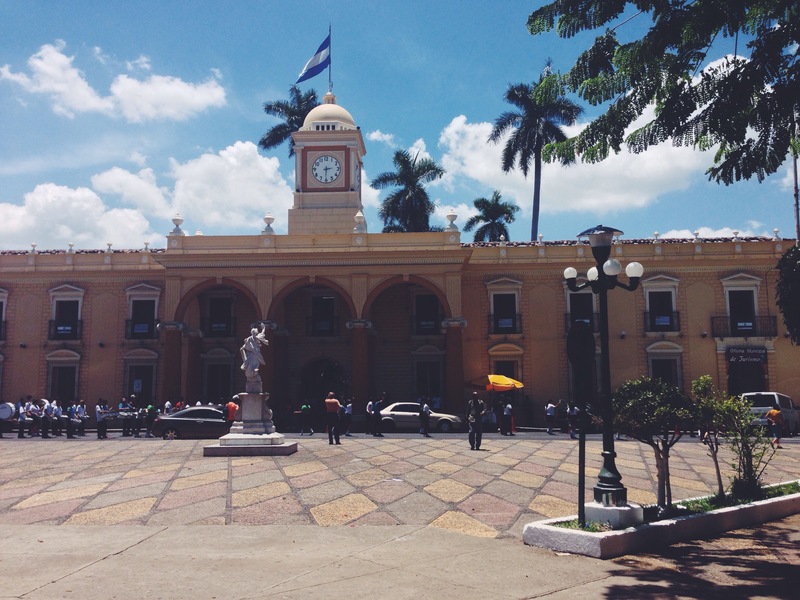 Though El Salvador is safe for foreigners, a lot of backpackers believe all the negative news of El Salvador has a result on the safety of themselves and decide to cross from Guatemala to Nicaragua without a stop in El Salvador. I probably would’ve stayed a bit longer if I had some more company, but more time in Nicaragua is something to look forward to as well. 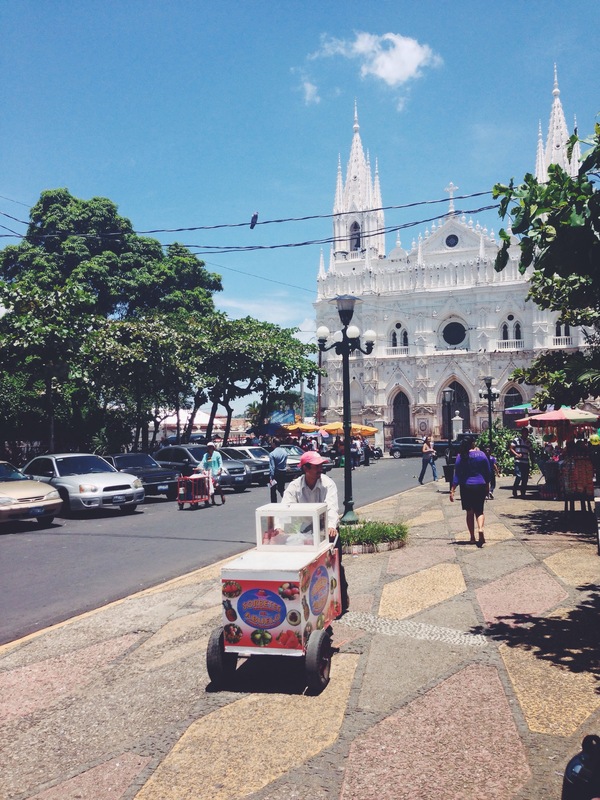 Previous PostLiving the good life in Guatemala – part II Next PostSand & glitter in Nicaragua.